As DNA’s less famous brother, you’d expect that less research has been done into tapping into RNA. And you would be right. Most of what we know about RNA is related to targeting it—but we can’t change it, control it, manipulate it. At least, we couldn’t, until now. Researchers from MIT have found proteins that allow the targeting of RNA molecules. These proteins can be programmed to attach to any RNA molecule of any length, and can allow the imaging of RNA inside cells, the monitoring of RNA activity, and even let us control RNA transcription. The study, published in the journal Proceedings of the National Academy of Sciences, details an approach called “Pumby,” short for Pumilio-based assembly. Pumby can attach to any RNA molecule since it is modular, meaning specific amino acids have been found that can attach to each of the four different ribonucleotide bases. Link these amino acids, and you will have a protein that can bind to that specific RNA molecule. The researchers demonstrated their system, showing how the labeling monitoring, and manipulation system works. First, they created two Pumby proteins, using the modular design aforementioned. Each of the two also has half of a green fluorescent protein (GFP) molecule. 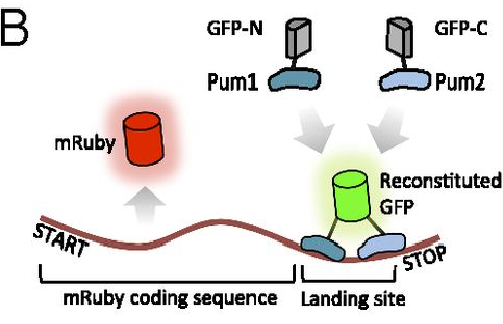 When two Pumby proteins find the target RNA, the two halves of the GFP join, lighting the RNA up with fluorescence and signaling the scientists that the target is present. Also, the use of GFP allows the determination of the rate of transcription activity of the RNA. Each time an mRNA molecule is translated, the GFP gets knocked off, and when translation is finished, another GFP binds to it, enhancing the overall fluorescent signal. This allows the researchers to calculate how often the mRNA is being read. Finally, the system can stimulate RNA translation, coaxing a cell to use more of a target RNA. To do this, the researchers attached a protein called a translation initiator to the Pumby protein. This allowed them to dramatically increase the translation of an mRNA molecule that normally wouldn’t be read frequently.